Meet Jimmy. Quiet brother, sharp shooter, dangerous one—to save his family he must leave them and undertake a mission where the only certainty is death. They know their enemies are coming for them, and the best course of action will send one of their own on a path for certain death. Jimmy Morning Star volunteers, because unlike his siblings—he has no one waiting for him at home. Young Shane refuses to be left behind and now Jimmy must undertake the dangerous task while keeping the young man alive. Together, they will leave Dorado and journey north—first to hunt the doppelganger and then to kill Adam MacPherson. Blue Eagle is one of the last of her kind, and gifted with Shamanic magic. Plagued by dreams that ask her endlessly for help and a vision quest that warns her destiny lies beyond the bounds of her tribe, she fights against the impetus to abandon those she cares for. When Blue narrowly escapes a slaughter, she understands the truth of her quest and strikes out on her own to place herself directly in the path of the hunters. 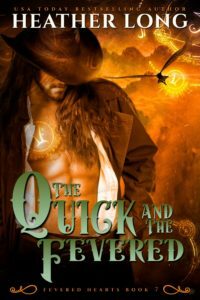 Quanto’s cryptic warning to keep the eagle alive is the only clue Jimmy has to the Cheyenne woman’s impact on his life, but it’s not her skills or her magic that worries him—not when need burns in his veins from the moment he sets his sights on her. He has to finish his task, but is he willing to sacrifice the one woman he could love to save everyone he cares about? His mission. Her magic. Their migration.